The R&D team plays a key role to make Jeil Jersey a trendsetter in the market. Jeil Jersey R&D team reconnoitering seasonal domestic and international market researches. Every season R&D team key members go to various of fabric exhibitions in the world; for domestic market inland Korea and Japan, for international markets with inclusion of Texworld Paris, they also participate "Preview in New York", "PGA Show", "Salon Int. De La Lingerie", etc. After reconnoitering, R&D team analyzes each materials' patterns, technical characteristics, and performance. 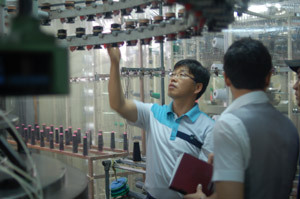 Following analysis , R&D team creates inner suggestions of materials and concepts. And at the development part, R&D team focuses on "how to make it better" aim. Better style into performance, better performance into technic, and better technology into green. Through R&D team, fashion information and trend exchange service provides which material would be "the most suitable" for our customers. In this way, R&D team reinforces quality improvement of the items in hand, and develop new innovative materials. Long term business cooperation with our customers makes this reinforcement more efficiently. Because as an OEM service solver, we are aware of that to embody our customers' brands. Thanks to these analysis, informational exchanges and developments, Jeil Jersey provides more than 4,000 kinds of own created innovative and "licensed" natural/synthetic fabrics. Jeil Jersey manages whole its from yarn to knitting/finishing process by work sharing all departments. Manufacturing department continuously manages and adjusts quality. Producing processes, yarn/knitting/finishing data, and other variables and effective inner departments communications are the secret of our jersey fabrics top quality all the time. By courtesy of manufacturing department's effective inner communication with R&D team and outer communication with markets and customers also important to develop new materials. As proved by the accomplishment achieved in more than fifteen years of industry, we proffer the superiority of Korean fabrics and garments to all markets, and we actively co-operate with our clients to the success of the highest performance, comfort and elegant fabrics to the market. In order to growing export demands, in 2010 Jeil Jersey expanded the export department. We updated all the previous demands data, building a new CRM system and added international members into team. With this new international face, updated ERP data and "just in time" CRM system, Jeil Jersey put spur to its international growth. Export department meets with international buyers and introduces the newest products to them through exhibitions and abroad market researches. Listen to new exciting opinions, to bethink suggestions and styles from the customers, and developing new materials accordingly, give us a chance to make our best for utmost level of satisfaction. Jeil Jersey CRM team provides customized consulting service to our clients, analyzes the newest trends in the market with them and to help to develop new items accordingly in each seasons with R&D department. For setting fashion trends in the market, Jeil Jersey CRM Team arranges customized "conception meetings" for each brands in each seasons. Through constant systematic production management efforts of CRM Team, and scheduling-quality identifying methods for production development make Jeil Jersey is the best company in the market. From the small garment maker to the huge multinational manufacturers, Jeil Jersey's clients find us to be a "perfect fit" for the production of high quality fabrics and garments to satisfy even the most exacting end consumer. 제일저지 내 R&D전담 부서에서는 매년 시즌 별 국내, 외 시장조사를 통해 소재 별, 패턴 별 트랜드를 분석, 시대에 앞서가는 소재와 컨셉의 제안을 통해 제일저지의 고객이 새로운 상품을 준비하는데 있어 또 하나의 커다란 지침이 되기 위한 노력을 하고 있습니다. 또한 각 패션업계와의 정보교류를 통해 각 브랜드에 적합한 소재를 분석, 그 정보를 제공, 활용하고 있으며 브랜드 및 생산부서와의 업무협력을 통해 새로운 트랜드에 적합한 새로운 소재를 개발하고 기존 제품을 개선 함으로서 제품 군을 강화하고 있습니다. 이러한 정보 교류와 분석, 개발을 통해 제일저지는 자체 개발한 천연, 합성섬유 아이템을 4,000여 종 이상 보유, 제공하고 있으며 특허제품인 ECO TWIST상품을 비롯한 매 시즌의 신소재 원단을 제일저지의 고객에게 발 빠르게 소개하고 있습니다. 제일저지는 생산을 위한 전문 부서 및 전문 인력을 배치하여 원사구매, 편직, 가공에 이르기까지 저지 원단 생산의 전 공정을 효율적인 방법으로 진행하고 있습니다. 또한 지속적인 품질관리를 통해, 편직, 가공데이터 보정 및 기타 여러가지 변수들을 효과적으로 조정하여 제일저지의 원단이 언제나 최고의 품질을 유지할 수 있도록 관리하고 있습니다. 이러한 제일저지의 전문 부서와 인력은 매 시즌 R&D부서에서 진행되는 신제품 개발에도 중요하게 작용하여 정확하고 효율적인 방법으로 최고의 원단을 개발하는데 있어 큰 역할을 하고 있습니다. 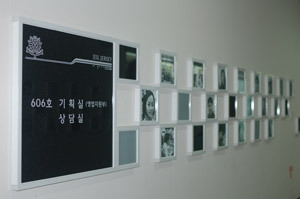 제일 저지 주식회사에서는 2010년 수출 전문 부서를 신규 설립하여 그 이전까지 진행되었던 해외 고객에 대한 수요를 모아 효율인 방법으로 대응함과 동시에 제일저지의 국제적인 성장에 박차를 가하기 시작하였습니다. 수출사업부는 해외 박람회 참가 및 해외시장 조사를 통해 해외 바이어를 발굴하고 제일저지의 새로운 제품들을 세계 시장에 소개 함으로서 저지원단 분야가 국내외적으로 크게 성장할 수 있도록 하고 있습니다. 또한 신규 및 기존 고객에 대해 소재 및 스타일 제안, 브랜드 별 맞춤 신소재 개발 제안 및 사후관리를 통해 해외 고객이 크게 만족할 수 있도록 노력하고 있습니다. 제일저지 고객만족팀은 국내 각 브랜드의 의류 전문가와 함께 밀접한 관계를 이루며 각 브랜드 별 맞춤 상담과 대응을 위한 고객맞춤형 상담부서입니다. 저지 원단의 최신 트렌드를 분석 제공하고 매년 새로운 아이템을 개발하는 등 R&D 부서의 긴밀한 업무협력과 브랜드 별로 다르게 기획되어지는 지속적인 컨셉 회의를 통해 매 시즌 국내 패션업계의 트랜드를 선도하고 있습니다. 또한 고객만족팀에서는 생산 일정 관리, 품질 확인 등 체계적인 생산관리를 통해 국내 브랜드의 시즌 별 상품 개발이 완벽히 이루어질 수 있도록 꼼꼼하게 확인하고 있습니다. 고객만족팀 전문인력들의 지속적인 노력을 통해 현재 재일저지는 국내 저지부분 1위의 자리를 지키고 있습니다.